Published on April 20, 2016 by Wade Shepard Follow me on Twitter here. 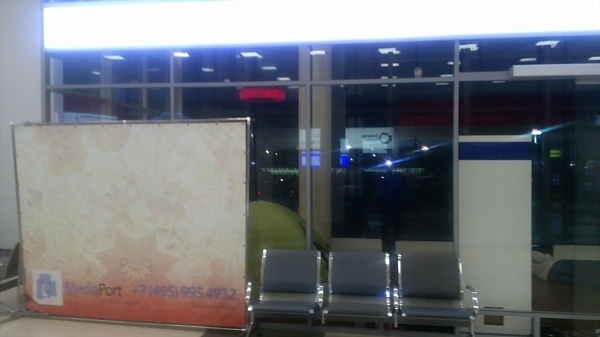 Hasan Yasien, the Syrian refugee who has been trapped in Moscow Sheremetyevo airport for over eight months, just informed me today that his impromptu home has been barricaded in. 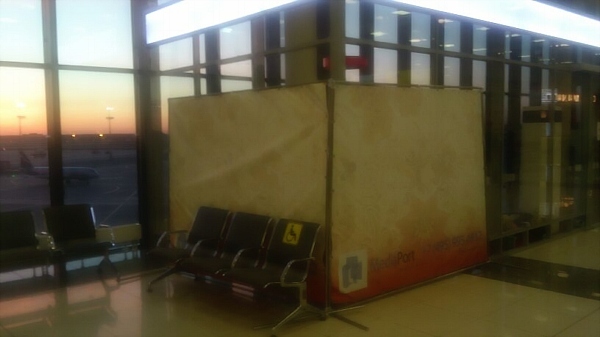 Hasan and some other refugees in the airport had made their home in a glass enclosed booth next to Gate 36 in Terminal E. Two days ago airport authorities put up partitions and chairs in front of the glass, possibly as a move to obscure Hasan from public view. 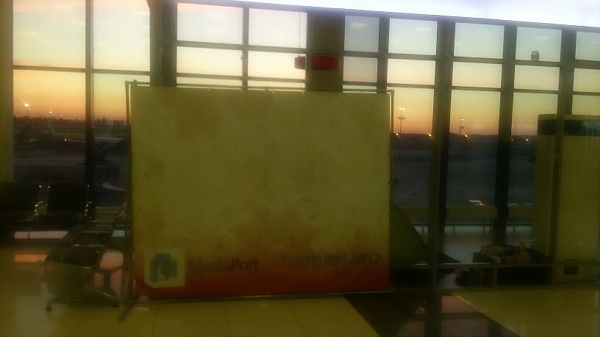 I imagine having refugees lying around isn’t quite the image the airport is going for. This move came immediately after Hasan talked with the Syrian embassy for the first time in his eight month stay. The embassy, apparently, acted as if they didn’t know of his existence in the airport, which Hasan doesn’t believe to be true. Anyway, they have not yet proved to have been of much help. Hasan has been appealing to every government agency that he could throughout his defacto incarceration in the airport. Neither Russia, the UN High Commission for Refugees, or anyone else has been able to help. Hasan has been given the following choices: return to a war-torn Aleppo, where he no longer even has a home; go to Iran, which Hasan doesn’t feel is much better than Syria; or remain in the airport. To refresh, Hasan found himself in this situation after he legally came to Russia on a work visa and subsequently had his application to remain in the country denied. He has attempted to leave Russia three times, and on all three occasions he has been denied entry to the countries (Turkey 2X and Lebanon) he was attempting to go to and forcibly returned to Moscow Sheremetyevo. Hasan feels that bureaucratic mishaps on the part of Russian authorities lead to him being turned away from these countries. Now, his “home” has been barricaded without his consultation. As is his character, Hasan just kind of laughed about it. He seemed to think it was rather ridiculous. “Did you want that to happen?” I asked, realizing that these “walls” may have been erected to provide him with a little privacy. He was referring to the row of chairs that have now been placed in front of the partitioning walls. “Do you think they are doing this to keep you from talking with people?” I asked. “Yes, of course,” he responded. Travelers have started pouring in to visit Hasan. Some of them read my initial article about Hasan and the other refugees there, and made the effort meet him while transferring flights at Shremetyevo. The word is now being spread about Hasan, on blogs like this one, as well as through various Facebook and other social media accounts. Connect with Hasan on Facebook here. Spread the word, he’s getting buried at that airport — literally.